Make adorable Valentine Card Cookies that are fun to play with as well as tasty! 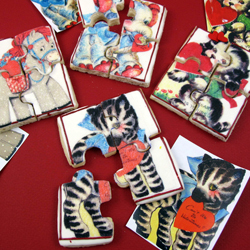 These puzzle cookies will give your special someone a truly unique treat. Make the dough and cut out the rectangle puzzle shapes using the our Toast Puzzle Cutter. Leave each cut rectangle of dough positioned together to bake–do not separate the puzzle pieces. Immediately after the cookies are removed from the oven, use the Toast Puzzle Cutter to recut the puzzle pieces in each rectangle. Gently wiggle the cutter when re-cutting the dough to make sure you have well cut pieces. Allow to cool. Preparing the wafer paper: Using the Toast Cutter, carefully trace the interior shape of the puzzle pieces onto the Valentine Card image you wish to use. Use a non-leaded pencil to do this. Cut out the puzzle pieces with craft scissors. Frost your cookie with a smooth coat of royal icing and allow to dry. If you are unsure of the right consistency for the royal icing, please read our tips under the How-To section at the bottom of our Homepage. The royal icing must be completely dry for best results. Simply spread a thin layer of clear writing gel to the back of your wafer paper pieces and then “glue” the wafer paper to the cookie, image right side up! To ensure a smooth finish, turn the cookie over, wafer paper side down, on a piece of parchment paper for approximately 30 minutes. To completely dry, turn the cookie design side up for 12 hours. You can add a 3 dimensional effect by adding small sugar pearls, dragees, sugar decorations or edible glitter. To adhere, just use a small dot of clear writing gel.